From the built-up masses of paint and sand to the oil seeping into the linen, erasure makes the body spongy and absorbent in Rita Ackermann’s Picnic (2012). 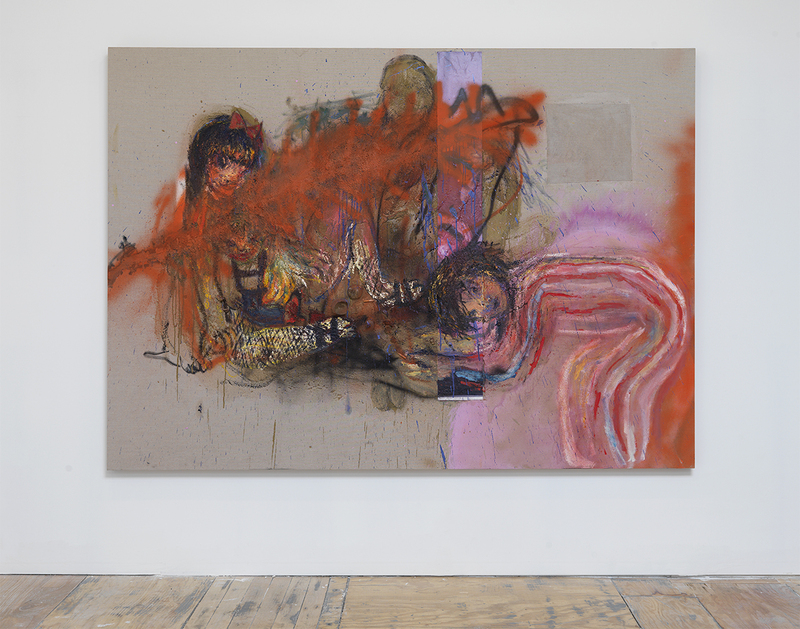 One has the sense that with Ackermann the figure is always both itself and becoming something else—multiple painting methods, events, and even zones make their way into a single body. It seems less about a figure being in a particular moment and more about the body as a site through which different forces flow; even a site through which different times flow. Part of this comes from many layers of distress. Patched on, stitched up, sprayed over, stained, smeared, covered, the painting never quite recovers from the disaster. Rita Ackermann, “Picnic,” 2010. Acrylic, sand, spray paint, latex, oil, tempera, printed vinyl, modeling paste, glass on linen, 72 x 101″. Courtesy of the artist and Hauser and Wirth. Photo by Brian Buckley. In Picnic, the figures in the scene seem surprisingly at home in the violent application of paint and matter, not to mention the suggestive, disquieting narrative of the scene. In the left half of the canvas, a deviant looking nymphet sits perched with her legs spread while in the lower right another less sinister girl bends over awkwardly staring out at viewers. Between them an ominous, more ghostly figure hovers, smiling insidiously. A mishmash of quick spray paint, splattered oil, sand, a long piece of cut canvas and a few cigarette butts among other objects cover much of the area where these figures meet. Bright oranges, pinks, and purples mix with large amounts of unprimed linen pocked with oil and clumps of sand. A fourth figure’s face, more animal than human, creeps in about halfway down the first girl’s upper body and may or may not be part of what looks like the outline of a dog or cat’s body to the left of the girl. The second girl’s blank stare directed out at the viewer coupled with her relative distance from the other girl leave it uncertain as to whether she’s inching toward or away from the other nymphet, lending the whole scene an oddly emotionless air; like this is something to which she’s all too accustomed. In The Wisdom of Art, Roland Barthes writes about Cy Twombly’s paintings in relationship to the idea of “event.” For Barthes, Twombly’s paintings perform several types of events all at once. In Greek these are pragma, tyché, telos, apodeston, and drama; in English, fact, accident, outcome, surprise, action. For Barthes, the refusal to settle into one type of event, the constant shifting between them in a single work, keeps the piece convulsing. Barthes talks about “it [being] easier to breathe,” about an “aerated space” here. Building off of this, one might say that Ackermann’s Picnic makes it easier to breathe in a state where we are almost always out of breath. Or it teaches us how to breathe in an accelerated state as we are shuffled between increased surveillance, Google Earth, and violence for and against a capitalist dogma. A figure appears as a fact, but perhaps more importantly, the before and after the fact as well. The body is always now, then, before, and after. It is a porous place allowing in foreign agents. This is painting accustomed to disaster, post-traumatic, post-operative, painting for an age in a state of exception, an age hurled from one extreme state to the next.